Probably you have been seen guitars with only one potentiometer - volume. The reason of using this kind of wiring is need for minimal impact on tone from potentiometers, when a tone control is not really necessary. But what we can do, if we want some tone control and we want also a natural guitar tone (no big impact from pots)? On this schematic, we can see three capacitors. 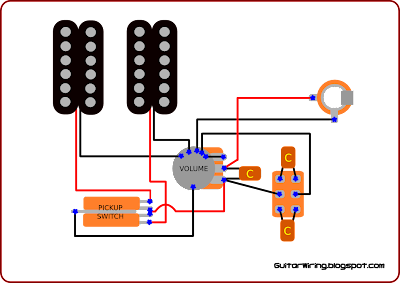 The treble bleed cap connected to the guitar volume pot and two tone caps connected to the DPDT on-off-on switch. The treble bleed cap will help us to avoid loosing the treble from the guitar signal, when it will be softened by the volume pot. The cap value can be chosen by a taste (around 600pf - 1200pf; it's good to start the test from something in the middle). With this values, ceramic caps are good enough. 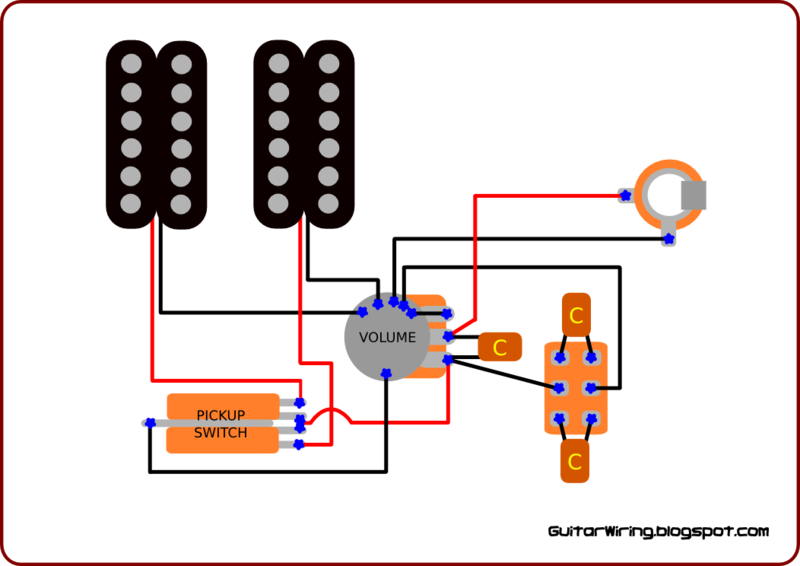 Capacitors connected to the switch will work like typical low pass filters. It's comfortable to heave one with typical value (for example 0,022uF) and one with low value (for example 8,2nF). We don't have a tone pot here, so choosing the right value is important for our guitar tone. Personally, I like to use this wiring with 6,4nF and 8,2nF (0,0082uF) tone caps, with no treble bleed cap.